Abeka designed these specific lesson plans with homeschooling parents in mind. This curriculum will guide you through the daily preparation, presentation, and review for all 170 lessons of 7th grade English. 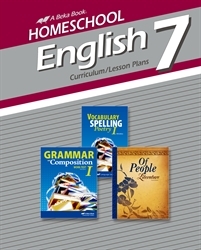 Complete with guidelines for grammar, spelling, vocabulary, poetry, and literature, these plans also include guides to writing research papers and book reports; procedures for homework, quizzing, and grading; extra diagramming examples; progress reports; and helpful hints for how to use the curriculum. Guide your child to the optimal learning experience as you stay organized with these easy-to-use, daily lesson plans.